I can remember back to my own graduation. I searched and searched and tried to find something completely unique and different than what my classmates might choose for my graduation announcement cards. Graduation is such an exciting time and is a chance to show off the big accomplishment and hard work that has led you or your student towards finish High School or higher education. Finding a design that expresses the success of that individual student helps to really show off their accomplishment in a way that can make your graduate feel special. Graduation announcements used to be so very plain and boring with a picture slid into the card, almost as an after thought. There are hundreds of fun styles now that showcase your graduate front and center where they belong! Here are 10 unique graduation announcements designs that are my favorite and tips to pick out your own favorite style! I really love these 4 designs! The top one shows personality and color and really showcases the graduate’s picture. Number 2 has a pop of gold that is perfect for graduation season and a great style for boys or girls. The third style I picked is more classic but still shows so much personality with a striped back and cut out corners. Finally, my fourth pick not only celebrates a graduation but shares the excitement of the graduates next stage of life showing off their college destination. It’s a really cute design if you don’t have a good senior picture to include. What is it that makes a graduation announcement unique? 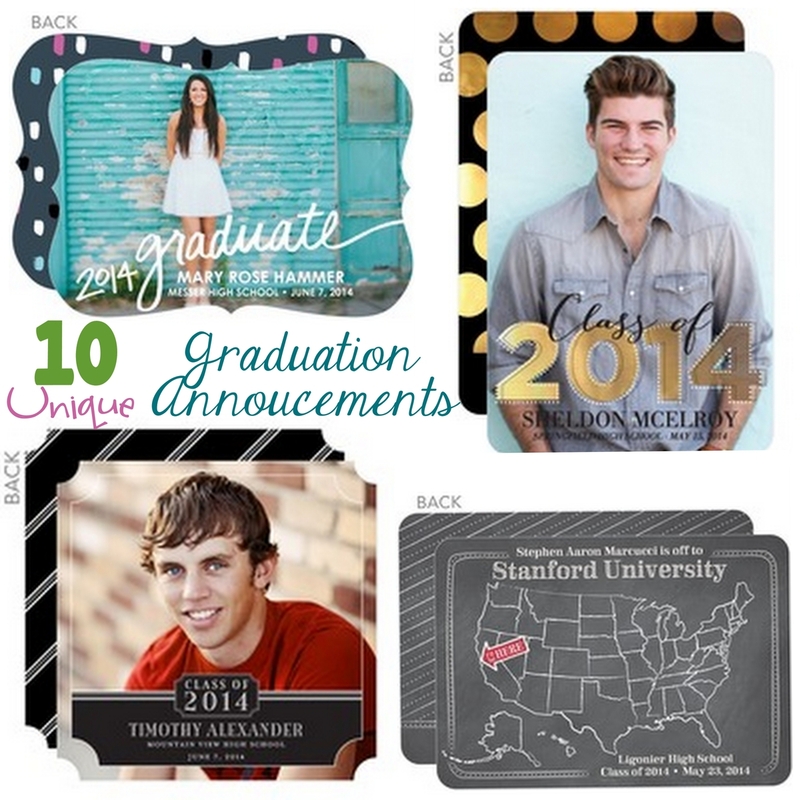 Here are a couple of tips to get you started picking your own perfect graduation announcement! Show personality – Look for colors and fonts that are the graduates favorites. Don’t think you have to stick with your school colors for the announcement. Get edgy – An announcement can come in any shape or form. There are options for folded, tri-fold, square, long and skinny rectangles and die cut cards. Picking a card with a unique shape adds to the overall look of the card and keep the announcements interesting. Picture perfect – In most cases, adding a bright, clear, beautiful picture to your graduation announcement will make your card stand out. Family and friends love to see their loved ones all grown up. When a senior picture isn’t available, go for a favorite grade school picture to keep that same sentiment. Or, go completely out of the box like the chalkboard states card above and show where they are headed to next which still shows personality even without having a picture. Go big – Choose one large image or one large with a few smaller images to really have the card standout. Small pictures are hard to see and won’t easily grab their attention like a large picture. Finishing touches – When you have found the perfect card, you can continue to make your announcement unique by adding something fun to the envelope or card once they are printed. Try punching out a corner or adding a small splash of confetti or a quick spritz of a favorite perfume can add an element of surprise for the recipient. 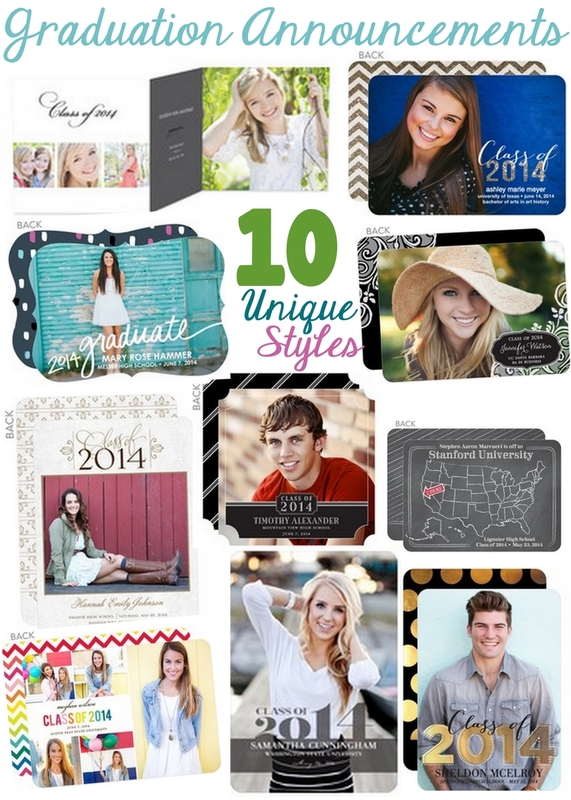 These graduation announcement and graduation invitation styles are on trend with hundreds of designs to choose from they have something for every personality. They even have a select few hand stamped foil designs that stamp an overlay of silver or gold onto the card for a bit of shine. Their styles are absolutely gorgeous already and then you have the chance to customize many of the cards by selecting a color scheme, trim, paper, and even background and picture layouts depending on the card. What do you look for in a graduation announcement to show personality?